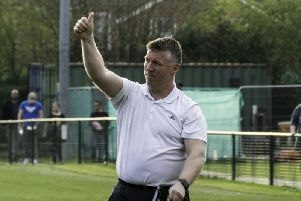 Ian Chapman has said he will fight for the cause of Burgess Hill Town as long as the chairman has faith in him. The Hillians have not won in eight games and they find themselves three points adrift at the bottom of the Bostik Premier table. Chapman knows it’s not good enough and he takes full responsibility for what is happening. The latest defeat came on Tuesday night in Suffolk, losing 3-1 to Needham Market. Chapman said: “Up to now we have not been good enough and I take full responsibility for that. But I don’t want to be looking backwards, we have to be looking forwards to get results. “I do speak to the chairman and he wants me here. His fear is that I will walk away if it gets like it has and I have told him I wouldn’t do that. I am here to fight for the cause. “I am not stupid enough not to realise if I had only been here since we had been in this league, I would have been sacked by now because it wouldn’t be good enough. “But I have been here since the club was struggling in lower leagues and we have worked really hard. I don’t want anyone thinking its all smiles here, it’s a horrible place to be and it affects everything you are trying to do. Chapman and his men now face a pivotal period as the next four games are at the Green Elephants Stadium against Leatherhead (Saturday, 3pm kick off), Dorking Wanderers (Tuesday), Brightlingsea Regent and Enfield Town. When asked if this was the most important period of the season, Chapman said: “I think so. “The next game is the most important one but with the next four games being at home we’ve got at least seven points out of those games to give us a real chance. “The away games recently, Needham Market, Leatherhead, Enfield, we should have got something out of it. They are such small margins. You don’t get the rub of the green when you are down at the bottom.